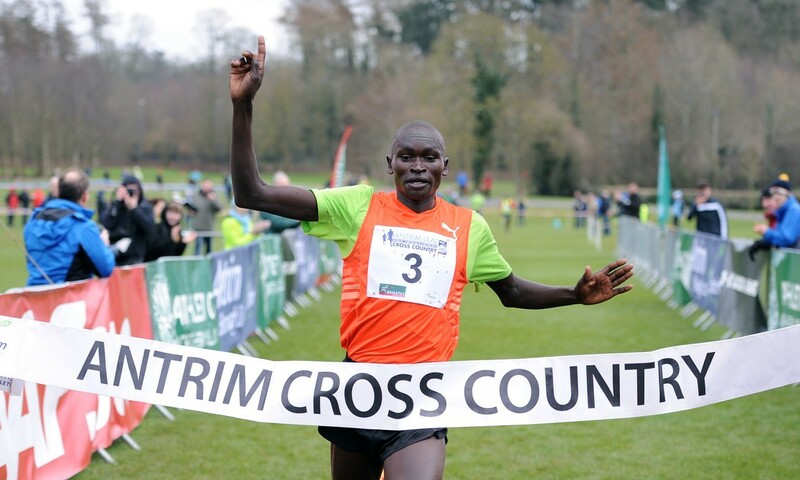 Thomas Ayeko of Uganda dominated the senior men’s race on a fast yet challenging Antrim course, Stephen Green reports. Ayeko moved clear of Kenya’s Edwin Soi in the final stages of the 10km race to win by 80m in 31:27 and regain the title he won in 2013. Soi clocked 31:40 ahead of compatriot Jonathan Ndiku with 32:25. First Brit home and winner of the Home Countries International was Andy Maud in fifth. Birtukan Fente Alemu of Ethiopia shook of the challenge of a delighted Steph Twell and compatriot Birtukan Adamu to take the senior women’s 7.2km race by a clear 70m in 24:12. Twell, who claimed the Antrim title as a 19-year-old in 2009, clocked 24:28 to finish 21 seconds ahead of Adamu. Maddie Murray of Scotland finished superbly in fourth to take the Home Countries win. Jonathan Davies and Rebecca Murray emerged as emphatic winners of the junior races, Davies clocking 22:15 ahead of Joe Steward and Kieran Wood, and Murray running 18:50 ahead of Jenny Nesbitt and Elizabeth Mooney in an England 1-2-3.